This spring we decided to expose Teddy to the world of art. Is it too early for two year old to paint with acrylic paints on a real big canvas? We gave it a try, luckily we found 4Cats Studio close to us and a convenient class schedule. It took 1 hour a week for 6 weeks to finish the painting. 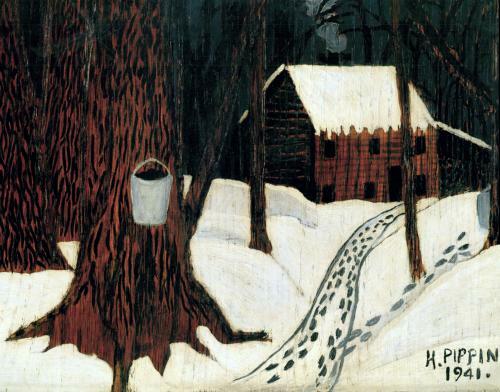 The theme for the painting was a Horace Pippin’s “Maple Sugar Season” work. Horace Pippin (1888-1946) was a self-taught African-American painter who worked in a naive style. When we came to 4Cats studio for first time, a big canvas stapled to the wall was waiting for us. All kids in the class were older then Teddy and attended the similar sessions in 4Cats before. First we drew with crayons on white paper until all kids come. Drawing exercises were stretching for a few minutes. After that we learned and practised to draw shapes that related to that class activity on a white paper. Then we drew those shapes on the canvas with chalk and finally applied a layer of paint. Every week we had a home work to practise drawing shapes required for the next week painting. Teddy was very serious about his homework and worked hard trying to learn how to draw circles, squares, triangles, rectangles and straight lines. It is very difficult for toddler to draw something meaningful with paints. There is a very limited room for mistakes. Once Teddy smashed some black paint over white surface on the painting and was so upset that started crying. We fixed it applying one more layer of white paint over a black spot and Teddy was happy again. At the end we added our feature to the original Horace Pippin’s idea – skating ring. It added some warm colors to the painting and made it unique among other students’ masterpieces. The good thing is that Teddy liked it and anticipated next class. He was always eager to go to the art studio and enjoyed being there. Of course, we helped him to do the most of the drawings, but it was a good experience for our family. We plan to take more classes next fall, when Teddy grows up and can be fully in charge of his work. Until then we’ll keep drawing at home – it was another new world discovered by Teddy.